Governor TA Orji has expressed gratitude to the Nigerian Army for collaborating with the State Government in eradicating kidnapping and criminal activities in parts of the state. Governor Orji was speaking at the Nigerian Army Finance Corps Biennial Training Conference 2013 with the theme:Transforming the Nigeria Army towards meeting security challenges and national development, the role of the Nigerian Army Finance Corps holding at the Michael Okpara Auditorium, Umuahia. He said that the State Government will continue to cooperate with the military to fight security challenges and described security as key to socio economic development. According to him, no investment in security is a waste and described the theme of the conference as apt. 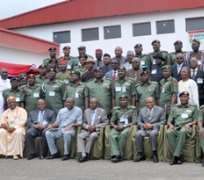 The governor who thanked the Nigerian Army for choosing Abia for the conference said the choice is a clear statement of the peace and tranquilty in Abia state making it one of the safest states in the country, attributed the achievements he has made to the assistance of the Army in instilling security in Abia. He stated that the military has defined a new role in sustaining the nascent democracy in Nigeria urging them to exercise caution so as to achieve a greater result in providing security in crisis prone areas of the country. The governor said he has no doubt that the military will rise up to expectation in protecting the nation's democracy and thanked the chief of Army staff Lt. General Ihejirika and other high ranking officers for their dogged fight in rescuing Abia and the country from criminal elements. In his speech, the chief of Army staff, Lt. Gen Azubuike Ihejirika represented by the General officer commanding,82 Division of the Nigerian Army, Enugu,Major AA Olaniyi said the conference will strengthen the military to be efficient in service delivery and in management of its resources , adding that the conference is timely. While thanking the governor for his logistic support to the military, the chief of Army staff assured that his men are combat ready to wage war against any cases of kidnapping, armed robbery and related cases in parts of the country. He stated his determination in transforming the Nigeria Army for greater performance and urged the participants to take the training seriously. Earlier, the Chief of Accounts and budget, Nigerian Army, Maj. Gen. A I Muraina said they have the task of managing the core finance operations of the Nigerian Army effectively in ensuring that resources are utilized in the most cost effective manner. Major Gen. Muraina explained that the conference will help them improve service delivery in the management of public funds through accountability and prudent management of their resources.